We constantly emphasise our goal of business leadership. We recognise this means assessing and adjusting our business and operational practices across the board. Our operating environment - and that of our customers - is under constant change and development in a host of areas. Environmental responsibility is an important, and growing, area of attention. It's certainly an area of importance to us. 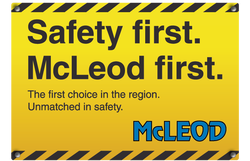 Put simply, McLeod is committed minimising the impact of our key activities on the environment. It's another aspect of leadership. A key one. Among our environmentally-focused activities, McLeod runs comprehensive electronic systems to create - as far as is practically possible - a paperless office. All crane jobs are dispatched via electronic dispatch with associated photos and forms. All daily, weekly and monthly checks are also completed electronically along with permits, rating charts and crane inspections. To put a figure on it, the systems have reduced the paper requirement in our workplace by over 90%. As a matter of course, McLeod recycles all waste oils, tyres, scrap metal, paper, plastics and glass.